Social media isn’t just about gathering as many customers as you can, like little prizes. It’s about establishing and maintaining a community. It’s one thing for a zillion people to click “Like” on your company’s page, but if they aren’t buying your products, who cares? Isn’t it better to have a smaller community who talks to each other and with which you’re able to communicate? This can lead to a better environment that allows you to bring in repeat business. Anything else is just a numbers game. 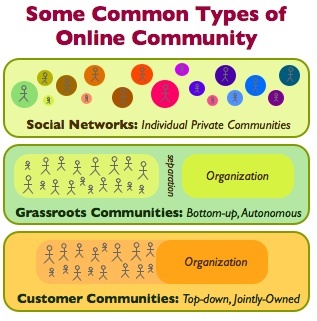 One of the best ways to foster an online community is by cross-pollination. This includes getting your followers to track you across several forms of social media. Are they on Twitter? Send them over to your Facebook. Are they on Facebook? Include a link to your website’s blog and ask them to comment. What this does is involve them in several different ways. Not only do they feel like they know everything about your company by being on top of all the news and conversations, they also are constantly reminded of your company every time they log on to their different accounts. Another important thing to remember is to vary your content. The more things that foster discussion the better. When people talk, they stick around. If they stick around, they’re more likely to buy more of your product! Each day think of the best content to put out for your customers. Maybe a few links here, some questions here, a little humor there. The best content is the stuff that gets people’s brains going during a routine workday. Maybe even start your own online game or puzzle? This really promotes interactivity not only with your company but between all your customers as well. Consider TV shows like Lost – each week an episode would air and millions of viewers would go online and talk about what they learned or what they thought. This would continue beyond the season and well through the summer. All the while, that TV show was on their minds. If some new product came out, you better believe it was snatched up! Consider what you can do to implant your company into customer’s minds and fostering an online community is sure to follow. Who do you think has the best online community right now?